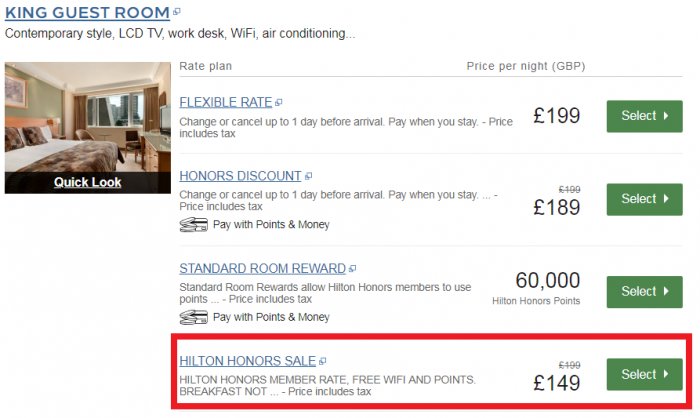 Hilton Honors has now launched their traditional Summer Weekends Sale for stays in Europe, Middle East and Africa, although some hotels may offer midweek availability too. Members can save up to 25% off of the Best Flexible rate (non-member discount is capped at 15%). The sale is valid for stays through October 8 and must be booked by September 3. Note that the definition of a weekend is Thursday, Friday and Saturday nights in some Middle Eastern countries. Hilton Honors tends to offer very good rates for stays in Europe, Middle East and Africa during this Summer Weekends sale. Just make sure that your plans are firm as this rate plan is prepaid, non-refundable and nonchangeable. Offer is subject to availability at participating hotels within the Hilton portfolio of brands in Europe, Middle East & Africa. Offer available for stays booked between June 5th, 2018 and September 3rd, 2018 and completed on weekends between June 8th, 2018 and October 7th, 2018 except as indicated below. For purposes of this offer, “weekend” is defined as Friday, Saturday and/or Sunday nights and in Middle East (excluding Turkey, Lebanon, Morocco, Africa) as Thursday, Friday and/or Saturday nights. Must book a minimum 3 days before arrival, this may vary and be reduced at points throughout the campaign. Full prepayment is required at time of booking. Your credit card will be charged immediately for the total amount quoted for the entire stay as reserved. Rates are not refundable; in case your contract with Hilton is governed by German law a refund of 10%, of the paid rates applies upon cancellation. In such case you may however prove that no or a significantly lower damage has been incurred for Hilton. Charges cannot be applied to other stays, services or merchandise. Booking cannot be changed. If you fail to arrive at the hotel on the scheduled arrival date, your reservation will be cancelled and you will not receive any refund or credit. Rates featured in advertising are the lowest rates available for destinations, not at specific properties. Blackout dates may apply and vary by hotel. Offer is subject to offer details herein and the individual hotel’s booking terms and conditions. Prices shown are per room per night based on two adults sharing. Unless otherwise stated, rates include taxes but exclude gratuities and incidental charges. Offer is not combinable with other promotions, packages, negotiated/qualified rate plans or bonus offers and is not valid for group bookings. 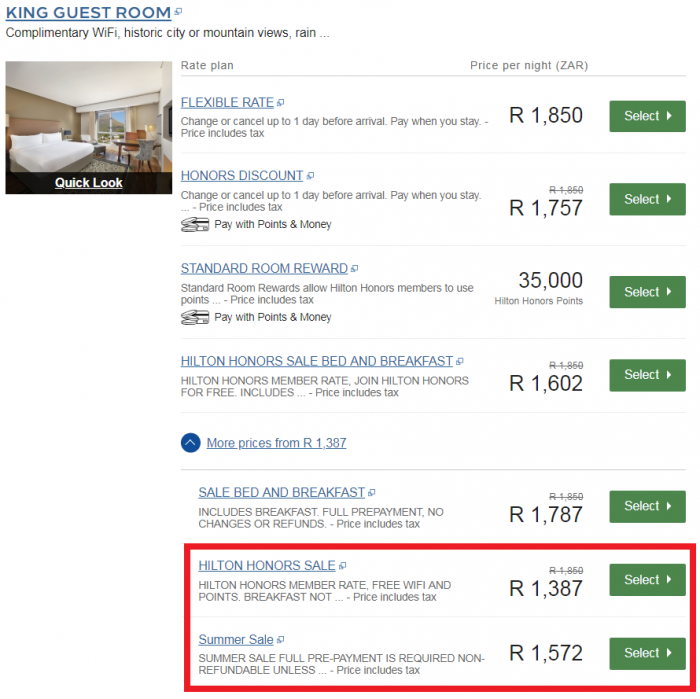 The Hilton Minibreaks offer of a 2nd room for children for half price is not combinable with this promotion. Participating Waldorf Astoria™ Hotels & Resorts, Conrad® Hotels & Resorts, DoubleTree by Hilton™, Hilton Hotels & Resorts®, Curio, a collection by Hilton, Hilton Garden Inn™ and Canopy by Hilton hotels™ are offering up to 15% discount (which varies by participating hotel) off the Best Available Rate and the Best Available Bed and Breakfast Rates. Participating Hampton by Hilton™ properties are offering a 10% discount off the Best Available Rate. Some participating hotels may offer availability on midweek arrival dates during the promotional period. 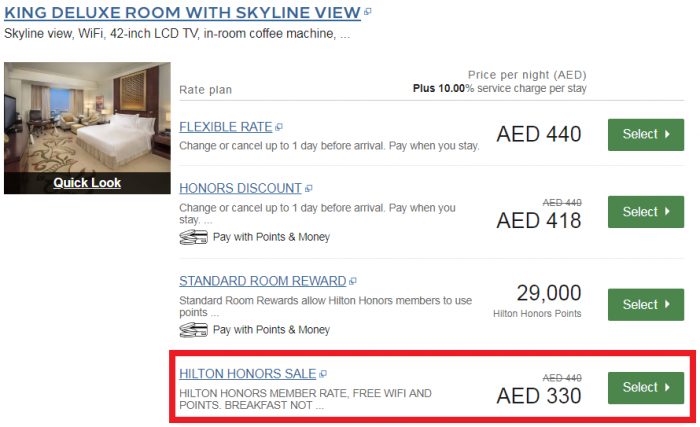 Some hotels may offer discount on premium room categories only (i.e. Executive or Deluxe rooms) and rates advertised may be for premium room categories. Some participating hotels may offer a discount off the Best Available Dinner, Bed and Breakfast Rate (or half board rate). The actual discount rate relates to the hotel’s Best Available (Flexible) Rate (“BAR”), which is a specific rate type that varies depending on time of purchase, is unrestricted, non-qualified and excludes discount rates. The Summer Sale Hilton Honors member rates are an additional 10% off the Best Available Rate and the Best Available Bed and Breakfast Rate (indicated above) for weekend stays, i.e up to 25% off for participating hotels as outlined above, except in the case of Hampton by Hilton™ properties where the additional discount is 5% . Where availability is offered on midweek arrival dates, Hilton Honors member rates are an additional 5% off the Best Available Rate and the Best Available Bed and Breakfast Rate for destinations in Europe, South Africa, Turkey, Tanzania, and Algeria, and an additional 10% off for destinations in the rest of the Middle East and Africa, except in the case of Hampton by Hilton™ properties where the additional discount is 5%. 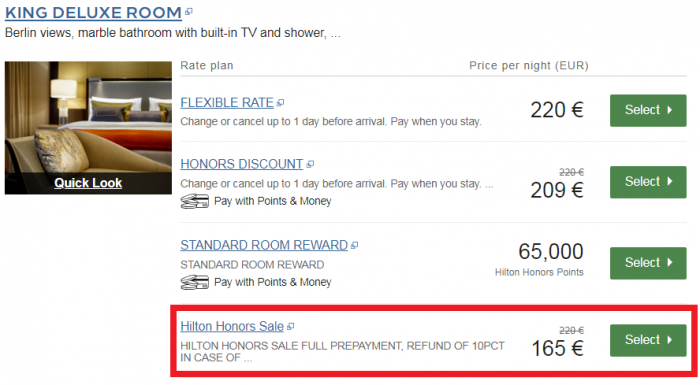 To qualify you must be a registered member of Hilton Honors™ at the time of booking and the booking must be made through Hilton direct channels: Hilton.com or Honors.com, or the Hilton Reservation call center (HRCC). Enroll at Honors.com before booking. Any currency conversions displayed on advertising are for comparison only. Reservations will be booked in the local hotel currency displayed. Currency rates utilised in each conversion rely upon several different public sources from other parties without independent investigation or verification and should be used only as examples. 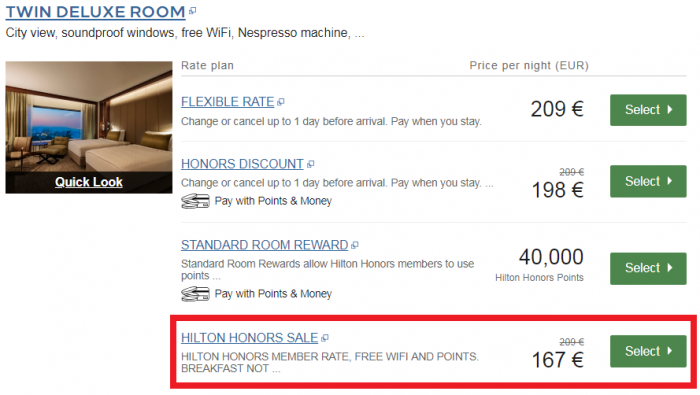 Hilton does not, and cannot, verify the accuracy of any rate conversion examples. Rates booked will be the Best Available Rates at the time of booking with the discount applied. Once the promotional period has ended Best Available Rates may fluctuate and other promotional discounts may be offered. In the instance that a lower rate is available after the sale period, the booked rate remains non-refundable.